It is never too late to prune. Trees and shrubs can be pruned any time of year. However, plants respond differently to pruning at different times of year. There are certain seasons for pruning to get certain results. The best time to prune a tree or shrub depends on how fast it is growing and when it flowers. How much to prune depends on how fast the tree is growing and how crowded the branches are. This can only be learned by experience. Start by noticing which branches have the most flowers and which branches produce the best fruit. Then prune to encourage the types of branches that are most productive. Pruning deciduous trees and shrubs in the winter when they are dormant (no leaves), will make them grow more vigorously in the spring. Dormant pruning reduces the number of buds to share the food stored in the roots, so each bud will grow more vigorously. Pruning deciduous trees and shrubs in the summer will make them grow slower the following spring. Summer pruning reduces the number of leaves to produce food stored in the roots. There is less food for each bud so the buds grow less vigorously. Winter pruning is recommended for young deciduous trees and shrubs, and fruit trees to encourage them to grow more vigorously. Summer pruning is recommended for full sized or overgrown deciduous trees and shrubs to slow down their growth. Plants that haven't been pruned in recent years should be partly pruned in the summer and the rest in the winter to avoid overpruning. Pruning off too much in the summer will stunt the growth, and pruning off too much in the winter will cause lots of suckers and watersprouts. Late spring pruning doesn't speed up or slow down growth so it is a good time to prune neglected plants. It is also good time to prune fruit trees since it is obvious which branches produce fruit and which ones don't. This is also a good time to remove suckers and watersprouts, the branches that grow straight up. They can be plucked off when they are still soft. They are less likely to resprout if they are plucked off, because cutting them leaves a stub with buds. Pruning evergreen trees and shrubs in the winter or summer doesn't affect their rate of growth very much because they store food in the leaves or needles, so stored food and buds are reduced about equally. Twigs and branches can be removed any time of year with the same results. However, shearing the tips is best done just before or after their spring flush of new growth, so the new growth can hide the cuts. Shearing evergreens in late summer or fall isn't a good idea because it produces brown cut ends that will show until the new growth hides them. Pines have special requirements for pruning because the buds are all formed at the tips of the new growth. Cutting off the tip of a branch will prevent the branch from putting out new growth. However, new buds will form if the tip is cut off during the soft candle stage, when the tips of the needles are just emerging from the candles. Pines can only be sheared at this stage which usually occurs in May or June. Branches can be pruned back to a side branch any time of year, but pine pitch borers are often attracted by pruning in the summer, especially if stubs are left. Winter pruning of pine branches is the least likely to attract pine pitch borers. Besides growth, the time of flowering affects the season for pruning. Spring flowers come from buds that formed the preceding summer. Late summer and dormant pruning will remove flower buds. Pruning spring-blooming plants soon after they finish blooming won't reduce the number of flowers the next year. Summer flowers come from buds formed on new growth. Dormant pruning will encourage larger flowers. Pruning off faded flowers will usually encourage more flowers. January to March: young or weak growing trees and shrubs, summer blooming shrubs such as roses, rose of sharon, crapemyrtle, and certain spiraeas. April to May: spring flowering trees and shrubs such as azaleas, camellias, daphne, forsythia, lilacs, rhododendrons, cherries, plums, deciduous magnolias, and crabapples, after they are finished blooming. Also, needle-leaf and broad-leaf evergreens can be pruned or sheared. June to August: overgrown or neglected deciduous flowering or fruit trees and shrubs, suckers and watersprouts, and faded flowers on summer blooming plants such as roses and spiraea. Also, needle-leaf and broad-leaf evergreens can be pruned or sheared. September to October: only necessary pruning to prevent limb breakage during winter weather. November to December: perennials and shrubs that die back over winter such as hydrangeas, and Confederate Rose hibiscus. Dead or diseased wood should be pruned out immediately in any season. Sterilize pruning tools with bleach or disinfectant between every cut to prevent spreading the disease. It is important that the correct pruning procedure is prescribed and carried out for the preservation of a tree’s health, safety, and aesthetics. The removal of diseased or insect-infested branches help a tree to live longer. Removing low hanging or rotten branches can prevent personal injury or damage to property. 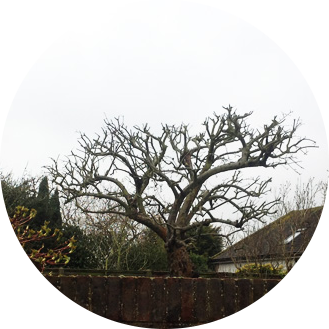 We also prune trees for structural integrity, stability in high winds and to improve the vista and solar penetration for specific parts of a property.Some trees are reared in abstract forms and are maintained as topiary. Often in the South East of England, trees which are growing close to property are reduced in size to reduce the water uptake from the clay substrata. During dry periods this reduces shrinkage of the clay which can contribute to the prevention of subsidence. Ashwood Tree Surgeons Ltd is a tree pruning company providing arboriculture services to home owners and commercial clients. Our staff of trained professionals are qualified to assist you with all of your tree pruning requirements. 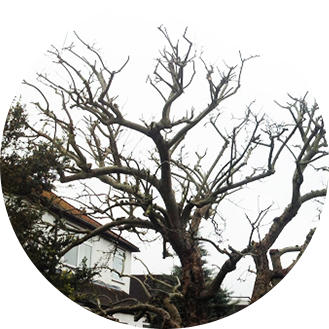 Ashwood Tree Surgeons Ltd are specialist in Pruning solutions however Timing is important when pruning, taking into account such factors as the blooming times of flowering trees and susceptibility to certain pests and disease. Correct pruning is important to maintaining healthy trees and also will ensure that the tree will heal quickly and properly. During our free consultation we will determine which type of pruning is necessary for your trees. To receive a free quotation either call or email us to book an appointment to meet with a member of our team.